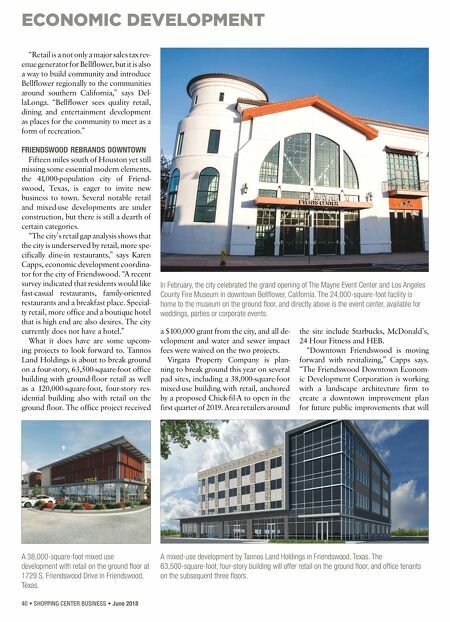 ECONOMIC DEVELOPMENT 40 • SHOPPING CENTER BUSINESS • June 2018 "Retail is a not only a major sales tax rev- enue generator for Bellflower, but it is also a way to build community and introduce Bellflower regionally to the communities around southern California," says Del- laLonga. "Bellflower sees quality retail, dining and entertainment development as places for the community to meet as a form of recreation." FRIENDSWOOD REBRANDS DOWNTOWN Fifteen miles south of Houston yet still missing some essential modern elements, the 41,000-population city of Friend- swood, Texas, is eager to invite new business to town. Several notable retail and mixed-use developments are under construction, but there is still a dearth of certain categories. "The city's retail gap analysis shows that the city is underserved by retail, more spe- cifically dine-in restaurants," says Karen Capps, economic development coordina- tor for the city of Friendswood. "A recent survey indicated that residents would like fast-casual restaurants, family-oriented restaurants and a breakfast place. 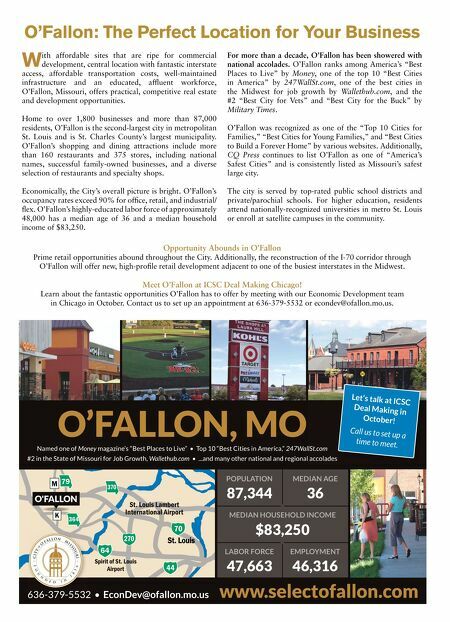 Special- ty retail, more office and a boutique hotel that is high end are also desires. The city currently does not have a hotel." What it does have are some upcom- ing projects to look forward to. Tannos Land Holdings is about to break ground on a four-story, 63,500-square-foot office building with ground-floor retail as well as a 120,000-square-foot, four-story res- idential building also with retail on the ground floor. The office project received a $100,000 grant from the city, and all de- velopment and water and sewer impact fees were waived on the two projects. Virgata Property Company is plan- ning to break ground this year on several pad sites, including a 38,000-square-foot mixed-use building with retail, anchored by a proposed Chick-fil-A to open in the first quarter of 2019. Area retailers around the site include Starbucks, McDonald's, 24 Hour Fitness and HEB. "Downtown Friendswood is moving forward with revitalizing," Capps says. "The Friendswood Downtown Econom- ic Development Corporation is working with a landscape architecture firm to create a downtown improvement plan for future public improvements that will In February, the city celebrated the grand opening of The Mayne Event Center and Los Angeles County Fire Museum in downtown Bellflower, California. The 24,000-square-foot facility is home to the museum on the ground floor, and directly above is the event center, available for weddings, parties or corporate events. A 38,000-square-foot mixed use development with retail on the ground floor at 1729 S. Friendswood Drive in Friendswood, Texas. A mixed-use development by Tannos Land Holdings in Friendswood, Texas. The 63,500-square-foot, four-story building will offer retail on the ground floor, and office tenants on the subsequent three floors.